The medical community has exhaustively researched how concussions affect consumers. Past studies have suggested that recently concussed drivers should stay off the road for longer periods, and some experts have been hard at work trying to develop a potential therapy for the ailment. However, one of the main focuses for consumers is how these injuries affect our nation’s young people. High school sports are part of the foundation of schooling in the U.S., but research has shown that it is also one of the biggest sources of concussions among youths. Most of these injuries tend to happen in practice, and they can happen to anyone, but new research shows that female athletes may be especially susceptible. A new study from the American Academy of Orthopaedic Surgeons (AAOS) shows that high school girls have significantly higher rates of concussions compared to boys. Viewed alongside past research about the long-term health consequences of head injuries, the researchers say that school officials need to take a hard look at how to keep young athletes safe. 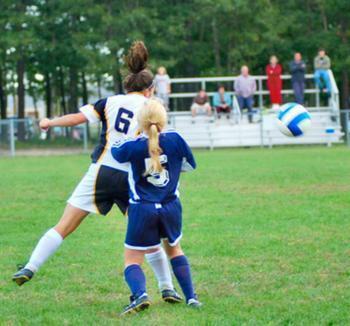 "While American football has been both scientifically and colloquially associated with the highest concussion rates, our study found that girls, and especially those who play soccer, may face a higher risk," said lead author Dr. Wellington Hsu. "The new knowledge presented in this study can lead to policy and prevention measures to potentially halt these trends." Every year, approximately 300,000 high school athletes suffer concussions or mild traumatic brain injuries (TBI). The consequences can be far-reaching and acute, and include symptoms like headache, memory loss, confusion, and dizziness, amongst others. As part of the study, AAOS researchers examined injury data reported in the High School Reporting Information Online injury surveillance system for the years between 2005 and 2015. In all, they found over 40,000 reported injuries and approximately 6,400 concussion cases. After analyzing the numbers, the researchers found that high school girl athletes experienced substantially higher rates of concussions compared to boys. In fact, the rate became so high in the 2014-2015 school year that girls’ soccer concussions outnumbered boys’ football concussions – no small feat. Other findings showed that although participation rates increased by a factor of 1.04 over the study period, concussion rates jumped by 2.2 times. The sports with the greatest concussion increases during the period were boys’ baseball and girls’ volleyball. The researchers believe the jump in concussion rates for female soccer players is attributable to a distinct lack of protective headgear and an increased emphasis on in-game contact and “heading” the ball. Additionally, they say that the enforcement of stricter TBI laws have provided first responders with greater awareness of the issue, leading to more diagnoses. “By identifying differences in the proportion and rate of concussions in high school sports, this study may help to inform future work aimed at examining specific risk factors and developing targeted measures to reduce concussion incidences,” the team concluded. The findings of this study were presented at the 2017 AAOS Annual Meeting.